I see only one problem with the latest drivers so far - these broken volcano. You may disable them in terra shaders, they are bad looking anyway. There is more: the textures of clouds on terra's is disappearing when coming closer. With older Nvidia drivers that is not happening. Now with the newer Nvidia drivers (including the one for the new GTX 1080 card), this is happening. Like the post of Ettore_bilbo is showing, I have exactly the same. Are the planetary textures in the download section still usable with the current build of 0.9.7.4? Planetary map addons in .pak format have to be placed under /addons/textures/planets/<planetname>/. THe folders have to be created if not existing. This doesn't appear to work, at least not with Jupiter and Saturn. Maybe the optional downloaded textures are just as good as the in game now. They are small downloads. Maybe the difference will be more pronounced with Mars, will try that next. Yes, install them as listed on the download page, just keep in mind what "textures" folder are now inside "data". Also, unpack SolarSys.sc from catalog file and double check paths to the textures - some of them was changed. Edit SolarSys.sc and save it. Already tried them in the new textures location, no go. I looked at the paths in the SolarSys.sc but they just seem to point to the folders located in PlanetsTex0974. Not sure what to do here. As above, I'm going to try Mars next. Should be easier to spot any differences. Ok Mosfet's advice to put them in the addons folder DID work. Much easier to tell with the Mars pack. Took a before and after pic. Beta Lyrae is suppose to be a contact binary or for right now very close. All I see is one star. I can't seem to find orbital data or radii estimates for the binary. 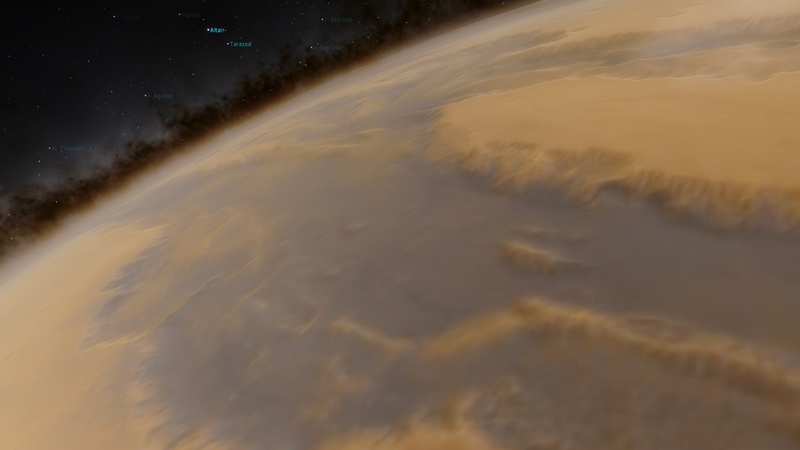 There is more: the textures of clouds on terra's is disappearing when coming closer. This is because of volcano. They are flooded entire planet with lava, rising up its surface to 10-20 km. So clouds became below surface. Oceans are also completely disappeared because of this. No, that is not what we mean. For example, the planet in the preset "You can't breath here". It is a green planet. When clicking on GoTo in the preset windows, you land on the planet, you see the green surface, you also see some cloud texture loading and then suddenly all clouds disappear. The same planet, but now going to it from space. In screenshot 1 you see cloud texture, and a little bit more movement towards the planet, the clod texture disappears, see screenshot 2. With Nvidia drivers from (lets say) 2 months ago, this is not happening. But with the latest drivers, this is happening. Plus, what HornBlower is writing: all terra and dessert planets look more flat. Here also: with older Nvidia drivers they have more structure/heights, with new Nvidia drivers more flat. Why is it that under the "Number of Planets" statistic for stars it includes dwarf planets? Dwarf planets are not planets. You're right! Actually it should read: 'Number of planets and dwarf planets'. But I think the string is too long. He would destroy the layout of the Info output. I think you can contend that a dwarf planet is a sub class of planet. I'm fine with calling them planets. I think one can argue that a dwarf planet is just a sub class of planet. I'm fine with calling them planets. I think one can argue that a dwarf planet is just a sub class of planet. No you can not. The IAU have specifically stated that dwarf planets are NOT a sub-class of planets. Space Engine isn't bound by the IAU, nor does the IAU have the authority to dictate what can and cannot be argued, especially outside the realm of academia. If Vladimir wants to classify them as planets for the purposes of this application, I'm fine with it. And I doubt the IAU will be calling.